Sorry I missed last night post, but I am not well – terribly sore throat – voice is not good, and I came home from work yesterday and fell asleep for a good long while! Still no better today, and I am hoping I am better for my class tomorrow otherwise I will be relying on sign language to give instructions! 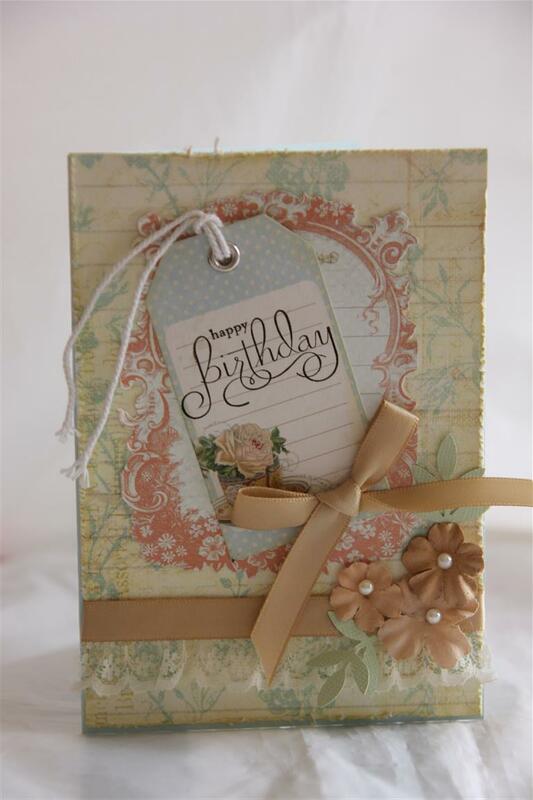 Todays card is the other card I had time to make using Prima Delight paper, ( love the image), and lace, flowers and a charm. I fussy cut the whole frame and mounted the girl image behind it. I think this evening I will pull out this paper and look at it again, see if I can do any more fussy cutting while I am watchingb tv. Til tomorrow…. A bit of a break from christmas cards.. Because i have been so busy with them I haven’t had a chance to have a good run with a lot of the papers i have been buying, this one included, and I can’t wait to find some time to really play with this one – Its, Prima Delight, and I have used the matching tags and flowers on this card too. I punched out some leaves, added a lovely coffeee satin ribbon, some lace, distressed and inked all my edges and done! Til tomorrow…. I recently bought some new papers which included a new range by prima – Delight. 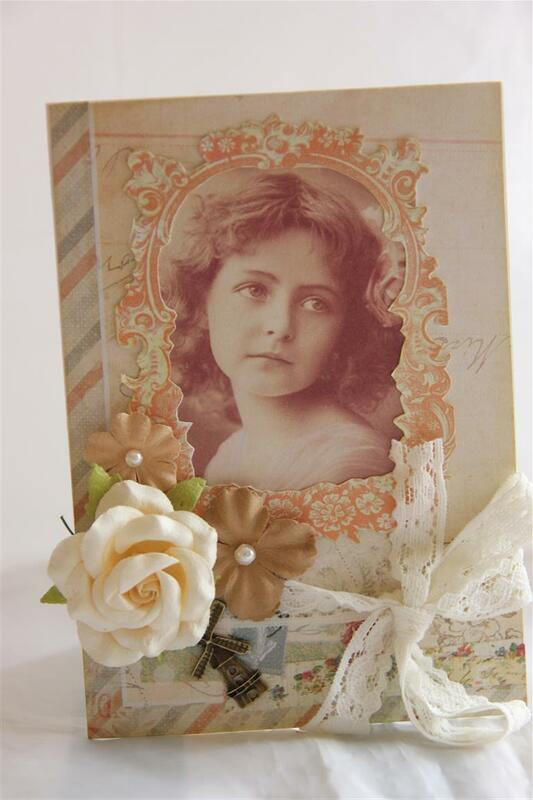 This is my kind of paper – great for vintage cards. So far i have only made this one card using it – been a bit busy with xmas cards, but hope to get back to it very soon! 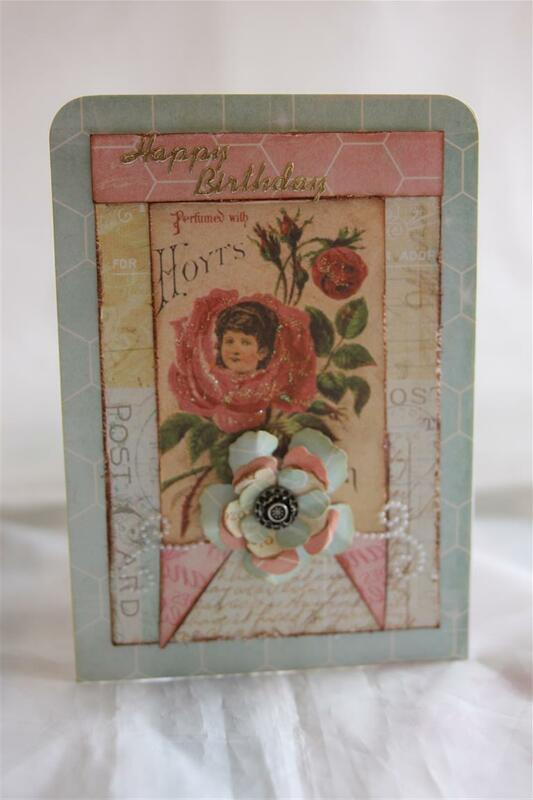 I created a few layers for this card, and distressed and inkied all the edges. I made a flower with my sizzix tattered florals die and put it together with a stampin up antique brad.The little pearl swirls are also from Prima. today has gone by so quickly, and I haven’t created too much but am heading off to the craft room now for an hour or so.. bliss…. til tomorrow….